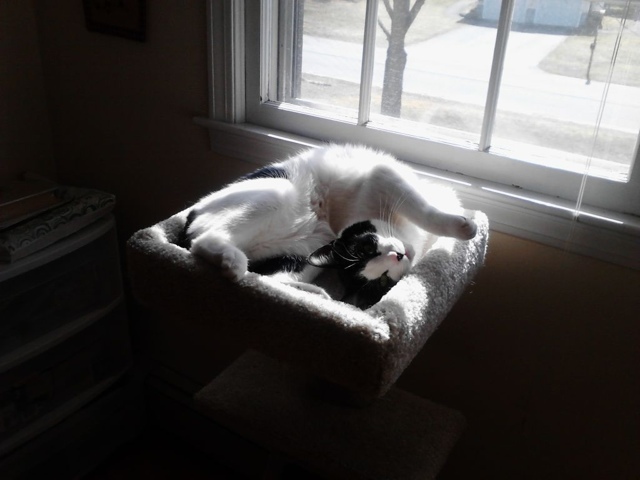 We have had our cat Oreo for almost two years. He is a strange, strange cat. He and I have had some serious battles of the will, and I am not ashamed to admit that I have considered offering him “alternative accommodations” somewhere other than my home. After nearly two years, he has finally let me use a brush on him. When I bought him a scratching post, it took nearly three months before he figured out how to use it. He has two litter pans, and does different things in each. He gets all out of sorts if I do not sit on the couch with him in the morning and then when I come home in the afternoon but other than that, I might as well not exist. They trust only their own judgment, and it takes some time before they are going to accept what you know is better for them because they have to discover it on their own. All you can do is be persistent and patient. The same can be said for congregations, especially those under 100-150. They generally are not too attached to an externally appointed leader who might leave at any time. As a result, they are not “domesticated” and tend to do things that don’t make sense to many ministers. My experience with pastoring this size of church for all of my ministry years has helped me relate to our cat and vice versa. A cat is just a cat, and an intimate congregation is an intimate congregation. You can’t change years (in cats’ case, millennia) of culture and thinking. I have learned some important lessons that I’d like to pass on. People can like you without following you. Don’t get upset that your congregation does not do everything you ask of them. Don’t leap to the conclusion that they are being obstinate or subordinate. We all have plenty of people who like us but don’t commit to our ideas. They are hesitant to invest themselves in someone who may be gone in a year or two. Which brings me to point 2. A pastor who won’t commit long term will get nowhere. If you can’t give your life to a calling, don’t accept it. Pastoring intimate congregations has to be an all-in proposition. You can’t be constantly flirting with other opportunities and focus your whole attention on the congregation you are leading. Lots of ideas aren’t a substitute for ideas that work. My cat loves to get into places we can’t reach him. I have tried everything to get him out, but you know what works? A little bit of chicken and a lot of patience. By the same token, I have tried lots of ways to get people to engage, and the things I have stumbled upon don’t make any sense to me. But they work, so I do them. Patience means lots of frustrations. Just reconcile yourself to the fact that sometimes people will frustrate you to no end. Vent your frustrations some place safe, and then get back to work. Sometimes my wife gets to feel the blast of my pacing, shouting, crying frustrations with people. But the people never get that. Why? Because the frustrations aren’t realities. They’re my human nature reading into situations. I use them to see how I could be a better leader, how I can equip people better. Then I go do that. Just some practical thoughts I wanted to share. Believe it or not, with eight years of tenure in our congregation, I am rapidly becoming one of the longest standing pastors in our area. Baffles me. I wonder what I will say when it is closer to eighty, because I’m not going anywhere.